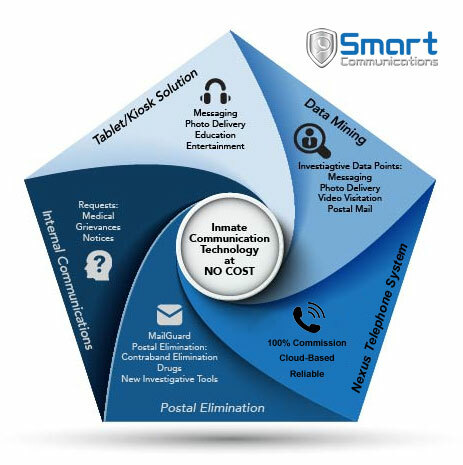 Smart Communications - Corrections, Simplified. The ultra-reliable, industry-leading Nexus inmate telephone system with 100% commissions. MailGuard® eliminates contraband, retains investigative intelligence, and adds safety at no cost. Electronic communications, education, and entertainment delivered through our kiosk or tablet platform. Combining proven inmate calling technologies with new Patent Pending electronic technologies, Smart Communications has created a completely new universe of inmate communication in one platform. The results? An all-in-one inmate communication platform, more technology, 100% phone commission and zero cost. Smart Communications is the new leader in inmate communications. The days of smoke and mirrors are over, Smart Communications is the new industry leader. Are you ready to take your inmate communications to the next level? Copyright © 2018 by Smart Communications Holding, Inc.